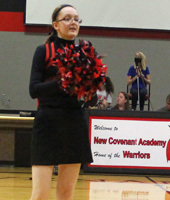 New Covenant Academy runs a junior varsity cheerleading pep squad program for girls in grades 7-8. 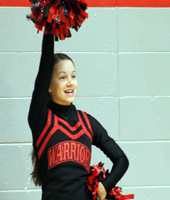 Students participating in this program, support the jr. high basketball team, learn basic cheer moves with regard for safety, develop self-confidence, leadership, positive attitude, along with friendships and a sense of belonging. 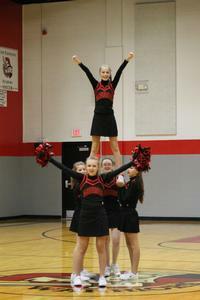 Jr. High pep squad season is in the fall; August to September. During this time period they practice approximately two times a week after school. "Our girls are expected to work hard together to create a supportive and an exciting atmosphere for our teams. Our goal for the girls is to work hard, show sportsmanship, demonstrate a Christlike attitude on and off the court, and to have fun!"